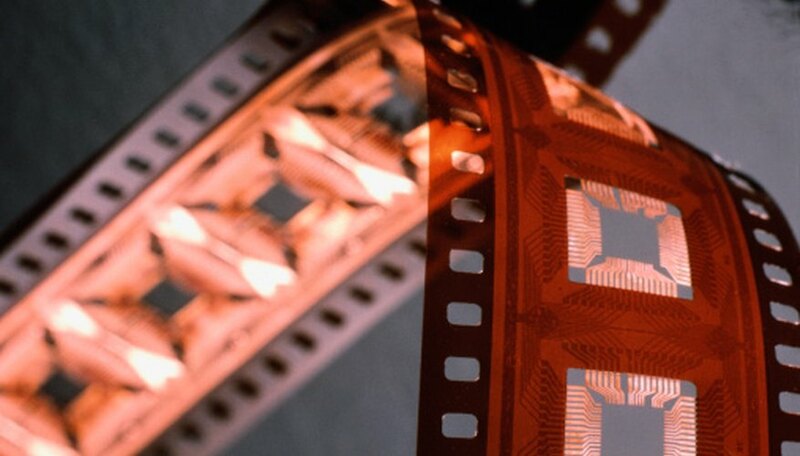 Film is used less and less for photography since the advent of digital cameras. And, even if you have old film negatives, you can convert them to digital. Once that is done, you don’t need the negatives any more. Recycle the negatives into trendy crafts instead of throwing them away. You can use the negatives as is to make small items, such as hair bows, cut them up to make smaller items, such as magnets, or attach them together to make larger items such as purses or lampshades. Fold the negatives. For example, fold a 6-inch length of negative so that the ends meet in the center. Secure the ends with tape. Wrap a 2-inch length of negative around the taped ends and secure with tape in the back to create a bow. Glue a plain hair clip to the back. Lace the negatives together. The holes along both sides of film negatives lend themselves to lacing. For example, thread about 36-40 inches of crochet thread through the bottom holes of two negatives of equal length laid side-by-side. Center the thread and then tie into a knot. Thread one side of the thread back and forth through every other hole. Repeat with the other thread, lacing through the unlaced holes. Tie the two threads into a bow at the top. Continue lacing lengths of negatives together until it reaches the size that you want and then use in crafts, such as covering a jar to make a votive candle holder. Glue negatives onto an object. For example, glue negatives onto picture frames or photo album covers. Glue negatives onto canvas to use in multimedia collages. Cut the negatives into individual frames and then use them in crafts. For example, make refrigerator magnets by gluing a negative frame onto a square of white card stock cut to fit, or cut the negative frame to fit inside a bottle cap painted white. Then, attach a magnet to the back. Use individual negatives to decorate scrapbook album pages or handmade greeting cards. Sew negatives together. Overlap the holes of two negatives of equal length laid side-by-side. Use a length of crochet thread and a needle to sew up and down through the holes. Form sheets of negatives sewn using this method into purses or clutches. Shine light through the negatives. Lace, sew, tape, or glue many negatives together to cover lampshades or make blinds or curtains for a window. If you don't have any film negatives, ask friends and family for theirs. How Can I Digitize an Old Picture? Where Can I Send My Film to Get Developed?